Jekyll and Hyde had nothing on Rocky Fork. In its 21-mile run, Rocky Fork undergoes a transformation from open sewer to picturesque stream. The most urban of the Mohican River forks, it slips from its headwaters into Mansfield’s postindustrial wasteland. As it emerges from the city, it sheds much of its turbidity and stench, cascading into the rural countryside of eastern Richland County. Rocky Fork is a tributary of Black Fork, flowing into it 4.5 miles downstream from Charles Mill Dam. Like Black Fork, it originates as an intermittent creek on high ground west of Mansfield and drops quickly in elevation as it flows downstream. During heavy rains, both become raging torrents of mud, water and God only knows what else. However, Black Fork’s terrain flattens out nine miles downstream at Shelby and stays that way all the way to Charles Mill Lake, while Rocky Fork’s elevation plummets all the way to its confluence with Black Fork. Between its point of origin and Shelby, Black Fork’s elevation drops 355 feet. Rocky Fork’s elevation level starts at around 1400 feet above sea level and ends at 980 feet. Furthermore, like the other forks of the Mohican River, much of Rocky Fork was dredged and straightened in the earlier part of the 20th Century, making it flow even faster. Because of its tendency to drain quickly, Rocky Fork traditionally served as an open sewer for the city and its industry, which included steel mills and the former Ohio Brass (on Touby Run, a tributary of Rocky Fork). 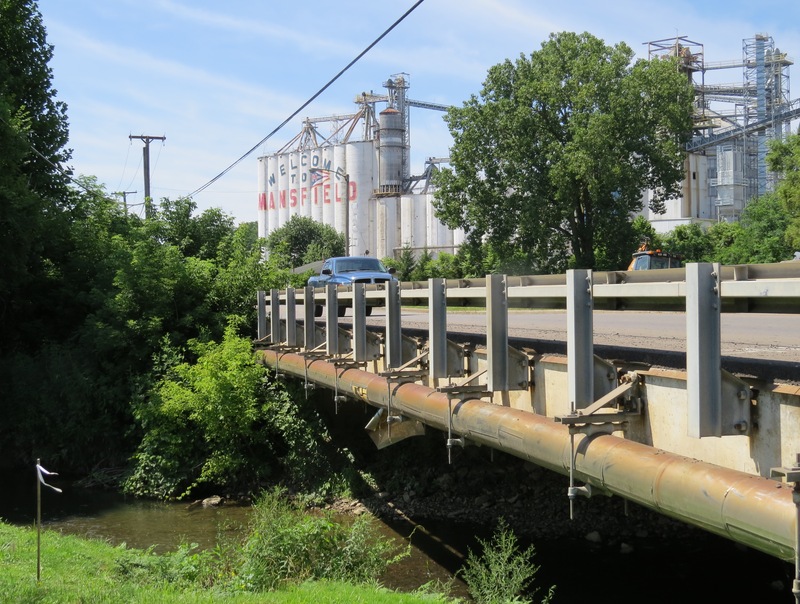 These days, a lot of Mansfield’s heavy manufacturing base has been replaced by salvage yards and similar operations — all prone to spewing dust and other contaminants into the soil, air and water. 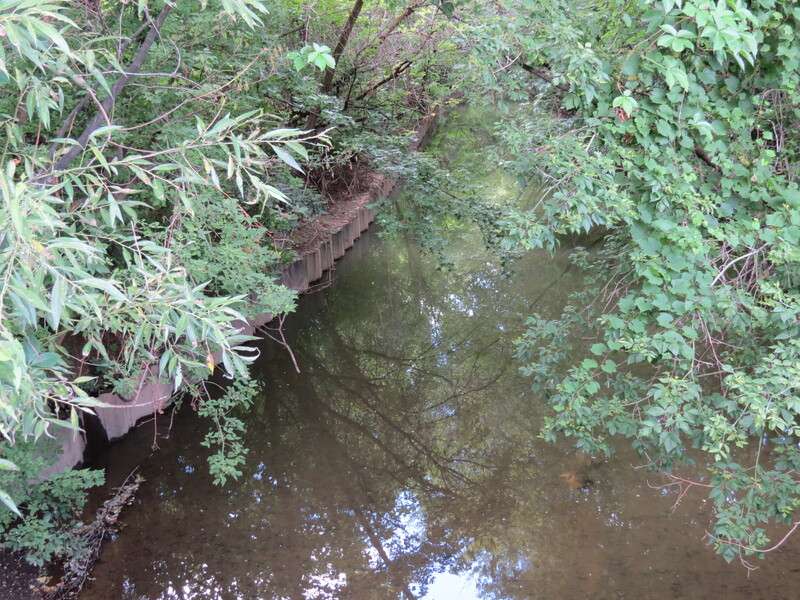 Rocky Fork at Wayne Street – still murky from its journey through the city’s scrap yards and factories. According to Mansfield area history buff Timothy Brian McKee, the city originally was platted around Rocky Fork in the vicinity of State Route 39 and the I-71 interchange. It was later platted on higher ground because of flooding. This proved to be a win-win situation for residents and the river: The city was able to grow and prosper while the lower half of Rocky Fork retained some of its original personality. In its final 10-plus miles, Rocky Fork flows past woodlands and well-kept farms. In some spots, the scenery would be worthy of a picture postcard. Unfortunately, the persistent stench of gray water serves as a reminder of its sordid past. On some stretches the odor dissipates, only to return temporarily as the river flows past wastewater treatment facilities. 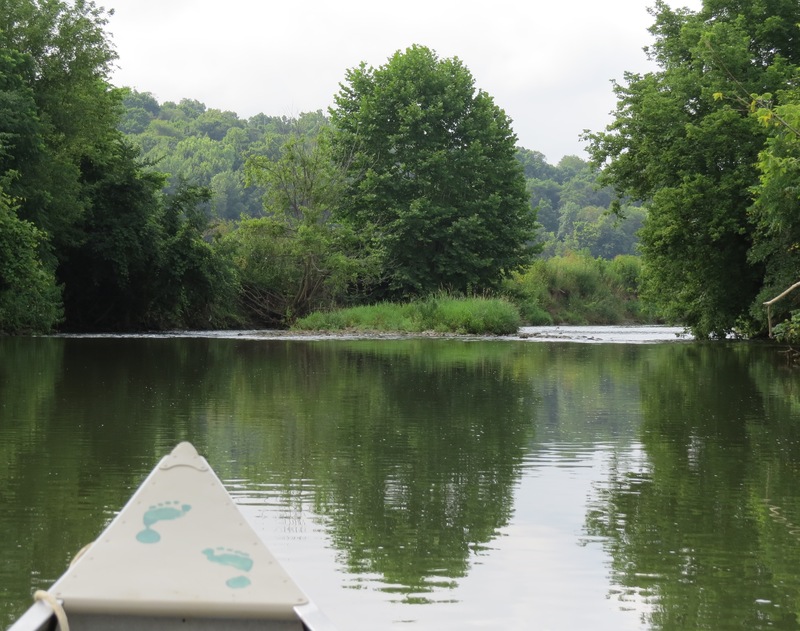 I recently spent a Sunday morning paddling Rocky Fork from the first Smart Road bridge to Black Fork, a trip of about five miles. It was a pleasant, but strenuous, paddle. Rocky Fork comes by its name honestly and it’s hard work dodging countless boulders and dragging the boat through shallow riffles. I used my 17-foot aluminum canoe for this trip for two reasons: Its flat, expansive hull distributes weight over a wider area, resulting in less draft (the amount of hull that rides under the water). Plus, it can take a beating better than my plastic boat. Rocky Fork is not a stream where you’d take your prized cedar strip canoe. Someone else’s cedar strip canoe, maybe, but not your own. 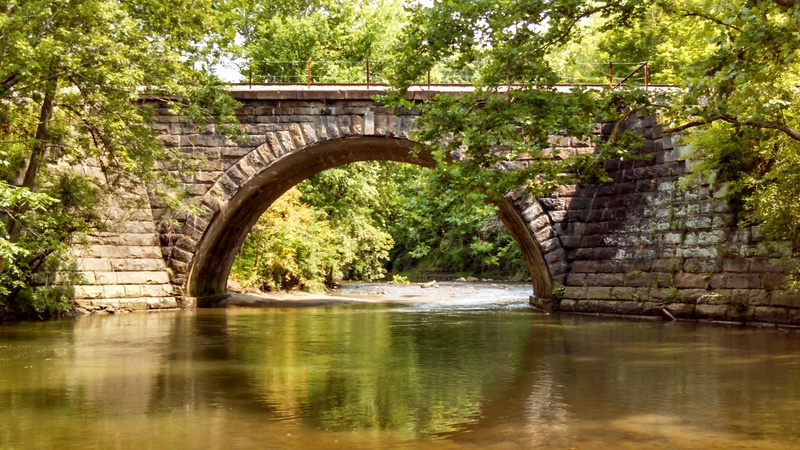 Rocky Fork in its other personality – a scenic rural stream. Note my granddaughter’s footprints on the deck plate. Rocky Fork can be run safely only when the water levels are normal or slightly above normal, preferably the latter. When swollen with storm runoff, it becomes a frothy brown torrent, rolling headlong through a narrow winding channel lined with low-hanging branches and downed trees. I hadn’t paddled this section of Rocky Fork before and was pleasantly surprised with its beauty. Except for a few brushes with civilization — an occasional house and the outskirts of Lucas — it remains fairly remote. There was one sign of civilization I didn’t mind seeing: A little less than a mile downstream from Lucas, a stone railroad trestle arches majestically over the river — a monument to a time when people valued aesthetics and durability. Rocky Fork runs through a wide valley, but the current has carved out a deep streambed. This gives it a feeling of intimacy similar to stretches of the Mohican River that flow through narrow valleys nestled in steep hills. For the most part, the banks are a combination of soil and rock. In only one location — between State Route 603 and the confluence — did I see a bedrock formation along the bank. On my Sunday paddle I saw plenty of ducks, heron, hawks and songbirds. I also came upon a mature bald eagle upstream of Kaylor Road and rousted a large doe that had come down to the river to drink. With the canoe constantly banging on the rocks, I probably scared off a lot of the wildlife before I had a chance to see it. The trip left the ’ol Grumman with a few more battle scars. There’s no harm in that with an aluminum canoe. Just gives it more character. I had paddled a section of Rocky Fork on a previous occasion, a more somber one. Two years ago, the Ashland County Sheriff’s Office dive team asked me to assist with a search for the remains of a man presumed to have gone into a rain-swollen Touby Run five months earlier. The victim, 56-year-old Gary Warner of Mansfield, had been riding a bicycle at night in an area plagued with recent scrap metal thefts. According to Mansfield Police reports, an officer spotted him and attempted to make contact so he could ask Warner what he was doing there. Warner — who was known to be excessively wary of police — bolted, leaving his bicycle behind at some point. The officer heard cries for help coming from the rushing water, then more cries further downstream, but was unable to locate or help Warner. Richland County authorities later searched Touby Run and Rocky Fork as far as State Route 603 but found no trace of Warner. Seeking closure, his sister, Sandy Warner of Arizona, asked Ashland County authorities to search further downstream. The Ashland County Sheriff’s Office dive team mobilized to search Rocky Fork from State Route 603 to the confluence and Black Fork downstream to Perrysville. 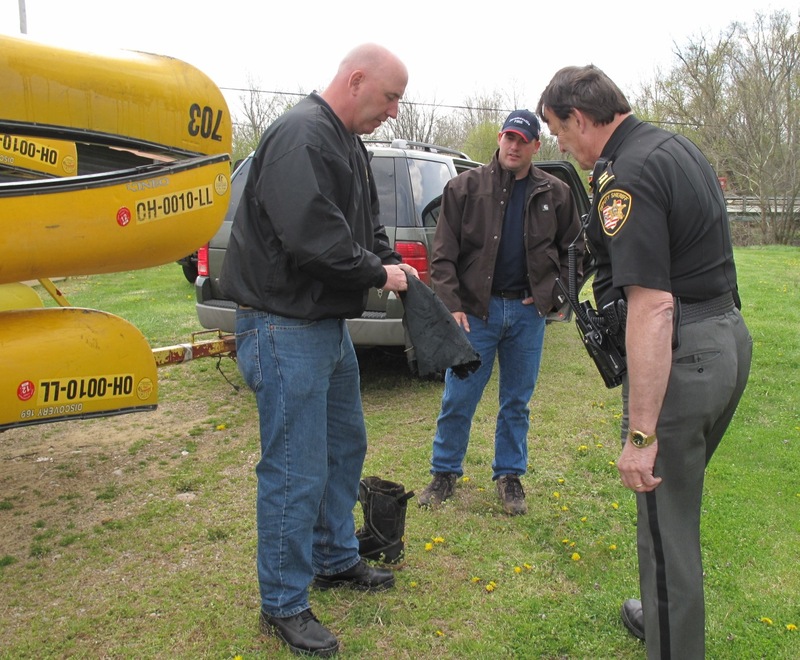 Lt. Scott Smart, fellow dive team member Gabe Campbell and Chief Deputy Carl Richert of the Ashland County Sheriff’s Office check out a piece of clothing found during a body search of Rocky and Black forks. Dive team commander, Lt. Scott Smart, recruited me to help with logistics because of my familiarity with the rivers. I also was acting in the capacity of newspaper reporter, writing an account of the search for the Ashland Times-Gazette. I can assure Sandy Warner that the guys gave it their best, combing the river by canoe and walking the banks on both sides. In fact, they were so thorough that I eventually had to hurry them along because we were in danger of not getting to Perrysville on time for our pickup. They found nothing except a tattered pant leg and boot, neither of which belonged to the victim. To me, a river is something that brings life and joy. But, as in Jekyll and Hyde, there’s a dark side to it. Dealing with death on the river in any capacity is a sobering experience. It leaves you with a deeper appreciation for the power of the river — and your own mortality.